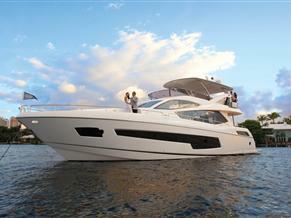 Looking for a new Sunseeker ? See the newest Sunseekers available. Have you considered buying new? Sunseeker is one of the most prestigious motor yacht builders in the world. These motorboats are built by master craftsmen at the Sunseeker headquarters in Poole, Dorset and other boat yards on the South coast of England. Painstakingly handcrafted from bow to stern, no detail is too small. Sunseeker boats have been featured in many James Bond films over the years including titles such as; The World is not Enough - Superhawk 34, Die Another Day - Superhawk 48 and Casino Royal - XS2000 and Predator 108. To own a Sunseeker motoryacht is seen by many as the ultimate lifestyle statement, a feeling that they have 'arrived'. Search for Sunseekers for sale on TheYachtMarket.com the global marketplace for boats.